Make obstacle avoiding, computer controlled and mobile controlled robot with the Explore Robotics Kit for Arduino. The sheild has a L293D motor driver and a DTMF decoder. 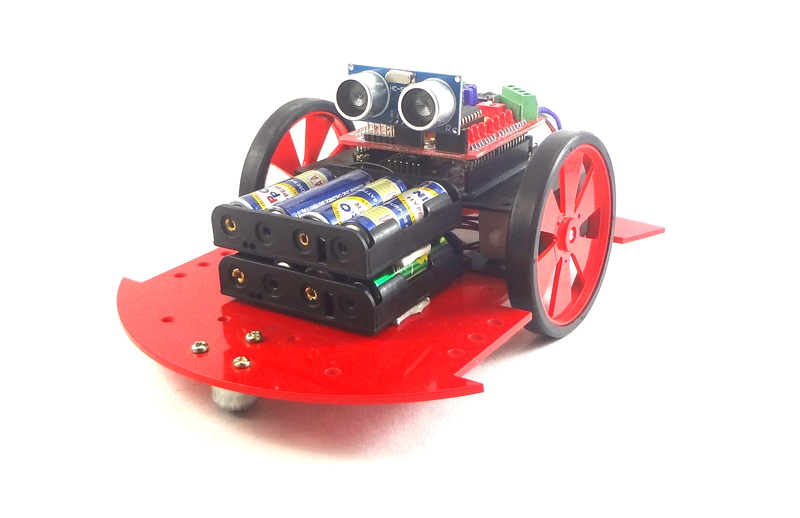 You can make a Mobile controlled robot in no time. The L293D driver can drive 2 geared DC motors. The sheild comes with a 3.5mm jack, which needs to be connected to any phone. This phone is kept on the robot and when you call from a different phone and press the keys on it, the Robot starts moving. The sheild also has a breakout for HC-SR04 Ultrasonic distance module to make obstacle avoidance robot. Check the sample codes in the resources section to know more. Note: Arduino Uno is not shipped with this kit you may purchase Explore One seperately. 9 LEDs to indicate motor driving and dtmf decoding.